​They both need a different approach. ​Mixing them might make a natural purification system fail (smells, less decay and destruction of bacteria life). Rapid pressure sand bed filters are typically operated with a feed pressure of 2 to 5 bar or can also be gravitationally. 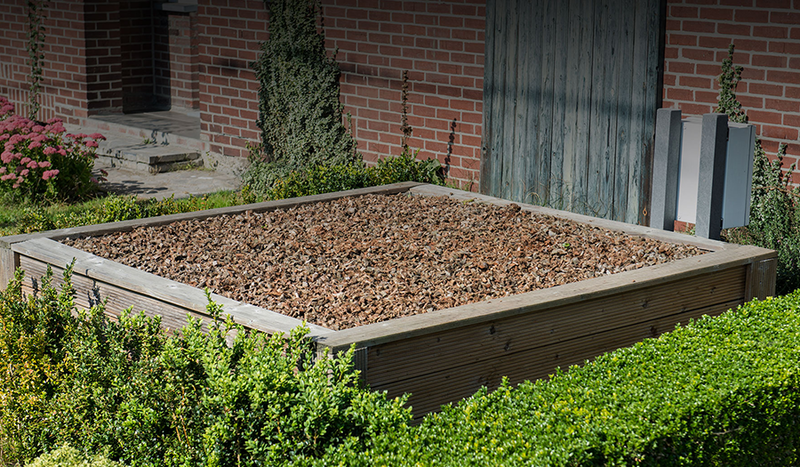 The depth of the sand bed is recommended to be around 0.6 - 1.8 m regardless of the application. Most rapid pressure sand bed filters use grains in the range 0.6 to 1.2 mm - rough enough to trap debris, but fine enough to allow water to filter through.​ Anything in the water that is smaller than 40 microns will most likely not be filtered by the sand. ​Often flocculation Chemicals are used to thread the fluid before filtering this will merge the particles and prevent them from going through the openings between the grain, but this is of course not ecological! ​There is a large amount of plastic filters available. Usually a pre-filter is used to Mechanically sift all of the floating particals out before the water is further treated. ​A common practise is to install a pre-filter in the outlet of the septic tank. Settling is a simple way to separate liquid waste from solid waste. The solid waste simply sinks to the bottom of a tank (eg. 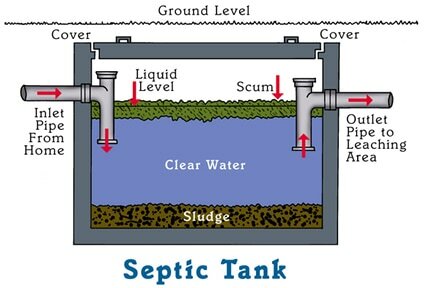 septic tank) and the fluid flows out of the tank to a next stage of the purification system. Usually the solid waste will automatically generate an anaerobe biofilter at the bottom of the tank and decompose. The fluid waste still contains a lot of chemicals and/or pathogens and need to be purified in the next step by means of (for instance) aerobe bacteria. ​Usually settling is an easier and better way of filtering waste water over sifting as you don't need to replace or clean any plastic filters and you have the advantage of creating a biofilter as mentioned above. As the title indicates, the speed of filtration is changed in the slow sand filter, however, the biggest difference between slow and rapid sand filter, is that the top layer of sand is biologically active, as microbial communities are introduced to the system. The recommended and usual depth of the filter is 0.9 to 1.5 meters. Microbial layer is formed within 10–20 days from the start of the operation. 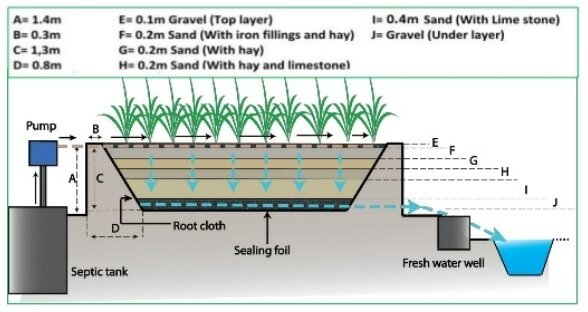 Most slow sand bed filters use grains in the range 0.15 to 0.30 mm. During the process of filtration, raw water can percolate through the porous sand medium, stopping and trapping organic material, bacteria, viruses and cysts. 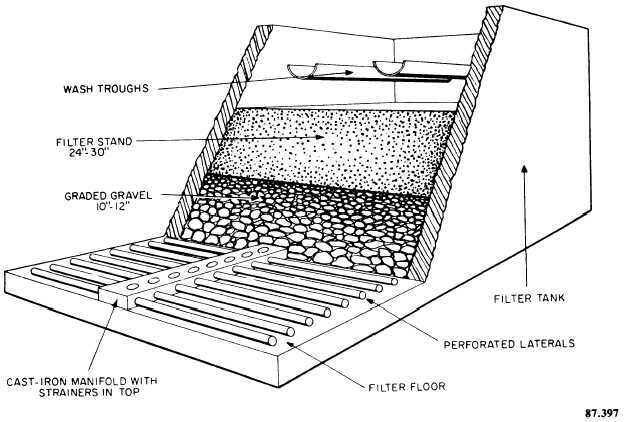 The regeneration procedure for slow sand filters is called scraping and is used to mechanically remove the dried out particles on the filter. However, this process can also be done under water, depending on the individual system. Slow sand filters are a good option for limited budget operations as the filtration is not using any chemicals and requires little or no mechanical assistance. Bacteria in a sand filter (the biologically active top layer) are aerobe bacteria, meaning they need oxygen to survive. To prevent suffocation of these bacteria there are a few options to aerate them: Helophytes, Fibres, mechanical aeration. Just like sand you can use other ceramic materials to create a biological active layer. Two commonly used materials are Lava rocks and lignite (>NL: 'Bruinkool'). Both of them have the advantage above sand to hold more oxygen an nutrients in their internal structure and by consequence they have a higher efficiency, but are less locally available and in case of lignite even fossil. Helophytes are plants that grow in marsh ('wetlands'), partly submerged in water, so that it regrows from buds below the water surface. The roots and activity in the top sand layer provide oxigen to the bacteria living there. This way a slow sand filter can survive longer without need for scraping and re-activation. The most common plants used in Helphyte sand filters in western Europe are Reed (>NL: 'Riet') and Yellow Flag (>NL: 'Gele Lis"). The main disadvantage of a sand filter is that it continuously needs waste water, preferably "Black water" to get enough nutrients, so the bacteria don't starve. When using Helophytes it is also necessary to have enough sunlight for the plants to survive. I'm using the general term "fibres" here to indicate there are many different fibres that qualify for purification purposes. Fibres have the same function as the sand in a sand filter: they provide a structure on which bacteria can grow. They actually grow the same kind of aerobic bacteria. While sand is pretty dense and less open for oxygen to pass through, fibres provide a light and open structure through which oxygen can freely move. In some septic tanks plastic fibres are used for this purpose. coconut fibres, flax fibres, hemp fibres can all be used. These natural fibres have another great advantage: when the filter is not contineously feeded with waste water (read 'bacteria food'), the bacteria will feed on the fibres. This is exactly why the fibres need a high carbon content. When choosing the right fibre think "wood": eg. only choose flax fibres that contain the rough wood-part of the plant. Also bark chumps of trees can be used for this purpose. Actually as fars as structure and nutrients go, a fibre filter is mimicing the top layer of forest ground. ​Anaerobe bacteria are excellent to breakdown nitrates and phosphates, hence an anaerobe bacteria purification system is indispensable when dealing with black water and grey. ​Generally anaerobe environments are created in tanks filled with moisted sludge. Anaerobic digestion occurs in four phases (Hydrolysis, Acidogenesis, Acetogenesis, Methanogenesis), each with different operating microorganisms, with different optimal environmental conditions. ​Different systems can be chosen depending on the kind of waste water to be threated. These variables, regarding the waste water, determine which type of digestor can be used: moisture content, retention time, temperature, loading rate. Digestors can be single- or multistage, can be a simple tank or have mixers and pumps but describing all types of digesters takes us beyond the scope of managing wastewater in a simple house. 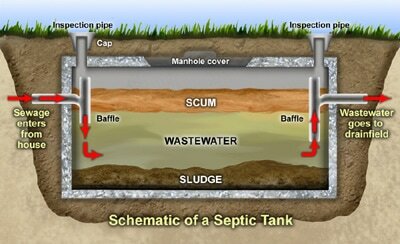 ​Generally a simple septic tank is used to threat black and grey water. Usually you need about 375L per resident of capacity for each type of waste water. So when purifying grey and black water you'll need 750L per resident. ​It is always better to use separate tanks for each water flow, because grey and black water have a different consistency and need to be threated with a different set of anaerobe bacteria. ​Rain water cannot be added to either tanks! Black water contains mainly nitrates where as grey water has a high phosphorous content. Aeration is used in drinking water treatment as a pretreatment in the process of removing iron and hydrogen sulfide (rotten egg smell) from water. Air is a powerful oxidizer of both iron and hydrogen sulfide. It quickly converts unfilterable ferrous iron to filterable ferric iron, and it reduces hydrogen sulfide to elemental sulphur, which is easily removed from water by a filter. ​In case of waste water purification the supplied oxygen is utilised by bacteria in the wastewater to break down the organic matter containing carbon to form carbon dioxide and water. Without the presence of sufficient oxygen, bacteria are not able to biodegrade the incoming organic matter in a reasonable time. In this case aeration can be done between the settling tank (anaerobic purification) and the aerobic purification. 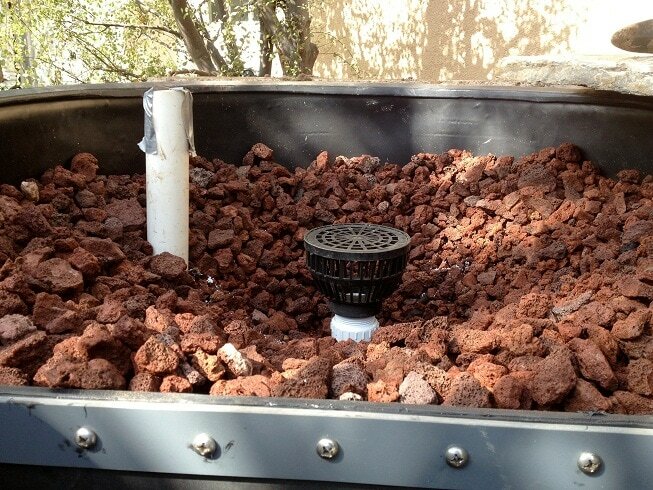 This can be done by having an extra small settling tank with a simple aquarium aerator inside. ​As chemical treatments are almost in all cases not really environment friendly, I will not discuss this here. There is no use in describing all different configurations of water treating systems as there are too many. All depends on your needs.